Like puns? 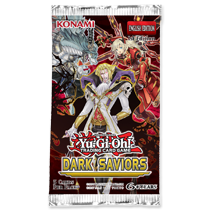 Hello Pojo Readers, Crunch$G here to tell you about what you should know about the newest Yu-Gi-Oh Product, this time over a Secret Forces or Spirit Warriors like set, this one being Dark Saviors. Now unlike Spirit Warriors previously, this set is more likely going to have a meta impact similar to how Secret Forces had an impact with Nekroz three years ago. Not only is there something for the competitive players, we got two archetypes that the casual players will likely enjoy, so let’s talk about these cards. It has been several years since Vampires got some support, and this set helps give the archetype a direction that it was lacking previously. 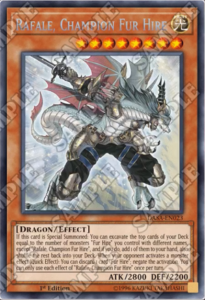 First off, they got a new XYZ Boss Monster, but it is a generic Rank 6, that can send a card they control to the GY and revive a monster of theirs that is destroyed by battle or sent to the GY by a card effect. 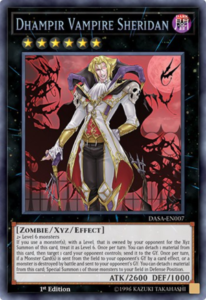 That revived monster in turn can be used to summon another one of the Rank 6 Vampires since it treats monsters you control that are owned by your opponent as Level 6. 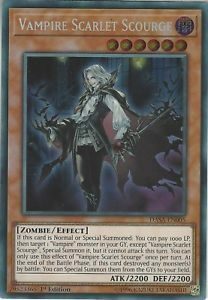 The rest of the Vampire main deck monsters are built around getting other Vampires on the field and paying Life Points to use effects. In turn, they also have several cards to help you gain Life Points by battling or in the Counter Trap’s case, negating a monster effect. Vampires have more of a direction now and previous Zombie support should help them be a solid deck overall. 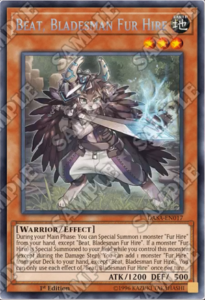 Despite the name, the Fur Hire archetype is pretty cool if you ask me. All of the Level 4 or lower monsters have effects that let you summon a different Monster Fur Hire from your hand so you can easily have a field full of monsters to battle for you. Not only that, but the smaller Fur Hire monsters gain effects when another Monster Fur Hire is summoned. The bigger Monsters Fur Hire have negation and protection effects to help your other Monsters Fur Hire as well as effects based on how many Fur Hire monsters you control. The archetype also has its own Monster Reborn to revive your Monsters Fur Hire and keep your armada established. Just note the Level 3 searcher and their Monster Reborn are Short Printed. The main reason this set is going to be as popular as it will be is because of the Sky Striker archetype. 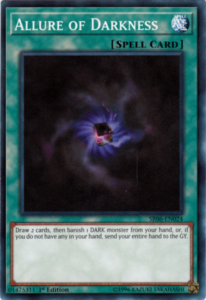 First off, this archetype only has one Main Deck monster, but that monster is easy to get to with the Field Spell and their own searcher and is useful to summon their Link Monsters to help keep circulating your Spell Cards. The FIRE Link Monster can get back any Sky Striker Spell from the GY while the WATER Link Monster can search for a Sky Striker Spell that is not in your GY already. 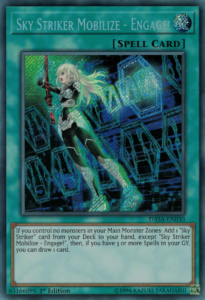 They’ll get a WIND that puts a Sky Striker Spell in the GY, but that is in Cybernetic Horizon. The main deck of this archetype is full of Spells though, all of which get bonus effects if you have three or more Spells in the GY, including their searcher can also draw you a card when you have three or more Spells in the GY. They also have several other cards that can disrupt the opponent and help keep generating card advantage for you. This archetype is highly consistent and will be played as its own deck as well as an engine for many other decks that can use the consistency boost. Just note that three cards that are Secret Rare are short printed and worth a ton of money right now. There are some really good reprints in this set that are worth having. 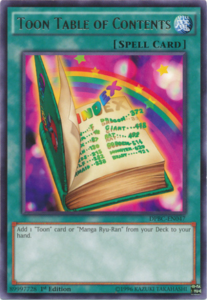 First off, Toon Table of Contents is in here to help the Sky Strikers and make the card more budget friendly. Allure of Darkness will always be a good reprint to have in any set. Drowning Mirror Force has a more bu dget holo printing now. The Monarchs Stormforth and Reinforcements of the Army have more holo prints now. Kuribandit is always a great card to have. Scapegoat is good for your Link Plays, especially with Knightmares out now. Foolish Burial Goods is another great reprint to have. A few of the Vampire cards that recently had a price spike are in here. This set is strong on the reprint side, and that isn’t even why people will buy this set. This is likely going to be one of the more meta impacting sets of the year. 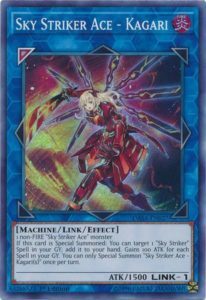 Sky Strikers are very consistent and powerful as an engine and a deck, and I imagine to see them everywhere. If you aren’t a competitive player, then I am sure Vampires and Fur Hire will be fun to play. This is a set worth opening as the Sky Strikers add a lot of value to this set and the cards inside it are overall pretty good.